Question: I don’t know anyone who fishes a double-taper line, but I notice that all the manufacturers make them. Somebody must be buying them. What are they for? Many manufacturers offer double-taper lines in their popular series. 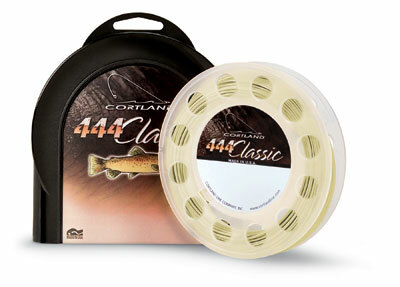 The Cortland 444 series, for example, includes both DT and WF configurations of their “Whisper Taper.” Photo courtesy of Cortland. Bob Streb—Vail Valley fishing guide: I do actually have a few double taper lines on some very light and short rods. I have always used them on small-stream rods where short casts are the norm. I also love the fact that they last twice as long—just turn them around when one end is spent. Yeah, I’m a poor fishing guide. Steve Hemkens—Division Manager, Orvis Rod & Tackle: You bet I own them and fish them. For many years when I was living in the Midwest, that’s the only line I would fish. I’ve always found the advantage of the double-taper line to be in mending. A traditional weight-forward line that does not have an elongated belly and rear taper designed specifically for mending and nymphing tends to transition quite quickly to a smaller-diameter running line. In situations where you want to get a long drift by feeding line downstream as your indicator drifts in the current—or just by making a longer cast, let’s say 50 feet—and then being able to mend from the tip of your rod all the way to the indicator, a DT is great. The reason for this is that the diameter and mass of the line stays fairly constant when you get farther into the line, whereas if have a WF line and you have a lot of line out, you are trying to use the fine-diameter running line (which has way less mass) to move the belly and the head—like trying to drive a nail with a tack hammer. You can do it, but it’s not that efficient. DT and WF lines are generally the same in the front taper and belly, so DTs still work great for close-in dry-fly fishing, and they can shoot to reasonable distances. But they’re not the kind of line you’d want to use to pound the bank with streamers out of drift boat or to make really long accurate casts to feeding fish; they don’t shoot as well because of the fatter diameter in the back of the line. However, they are great for controlling a lot of line out of a drift boat when you are primarily nymphing, and DT’s make a great all-around line for a wading fisherman who fishes smaller and medium sized streams. Plus if you are pinched in this economy, when the line starts to get beat up, you can turn it around and have a “new” line, as the back and front of a DT line mirror each other. Simon Chu—New Zealand-based angler: I still have some 2-weight and 3-weight DT lines for when I’m not looking to cast far. Plus they are better for roll casting and offer nice line control in the air and on the water. Dave Kumlien—long-time Montana guide and current head of TU’s Aquatic Nuisance Species program: Interesting question on double-taper lines. In the OLD days, when I first started working in fly shops, back in the mid-70s, we used to sell quite a few DT lines. The belief was that DT lines provided a more delicate presentation than the severe, steeply tapered WF lines; that you could more easily roll-cast a DT line; and that there was some economy in using DTs, as you could turn them around when you wore out the front. It is my opinion that, as line designs and materials changed, the so-called advantages of DT lines disappeared. There were less-severe WF lines introduced that provided for delicate presentations, longer WF tapers that you could roll cast, and the durability of lines increased to the point that there wasn’t the same economical advantage of reversing a DT line and getting more life out of the fly line. Frankly, I am not sure there really ever was an economy in the use of the DT’s as I found that when the front end of my lines wore out, the back end was pretty well shot, too. I have not owned or used a DT line in probably 25 years. I’ll be interested to read the responses to this one. Frank Smethurst—guide, star of film and TV, and Bigfoot hunter: Good question, and I can think of several reasons why I still fish with DTs. The main one is the manner in which they mend. A double taper can assist and enhance the far more complicated lateral and stacking mends that catch tougher fish. Current fashion emphasizes the casting portion of the presentation process, but I feel that mending the line is of equal and often greater importance when it comes to putting fish in the net. DTs throw an incredibly smooth and more controllable loop. I also really like the way that they smooth out and enhance some of the slower-action and fiberglass rods I often use. Brant Oswald—Livington, Montana-based guide and writer: I’m delighted to respond to this one, as some of these issues with line tapers are things I discuss with guide clients and casting students all the time. For me, the chief advantage of a double taper is that the long belly allows longer roll casts and line mends. With weight-forward lines, once the belly of the line is past the rod tip, the caster can’t impart enough energy to the running line to turn over the belly. Of course, this is the basic advantage of a weight-forward for overhead casting—to carry a shorter line in the air and shoot line for additional distance. But it limits the length of roll casts and mends, and it also means that if a caster does want to carry a longer line in the air, a haul will be required to maintain a stable loop. In some fishing situations (particularly fishing still waters), I like to be able to make a long pickup and recast to reposition the fly quickly. With a double taper, this can be done with a single back cast and forward cast; with a weight forward, this often requires stripping the line in, picking it up, and then using several false casts to work the line back out. A couple of final thoughts on double tapers: The long belly means they are much bulkier than a weight forward in the same line weight, so a larger reel/spool is usually needed to allow room for the line and backing. And some still tout an advantage of a double-taper line is that it can be reversed for additional life. True, but anglers should pick a line taper that best suits their fishing, rather than one that may save them a few bucks over the course of a season or two.